Can you identify this site? If you know the answer, you’re welcome to post it in the comments below. If you discover the answer by research, please do not post it in the comments below. I’ll post the answer, source of the quotation, and a photo tomorrow. The best way to get up to speed on the major discoveries at Hazor from the Bronze Age is with Amnon Ben-Tor’s article on the ASOR Blog. A brief report of the finds and surprises from the season at Gezer has been written by the excavators. This year’s excavations of Gath are over, but Aren Maeir is making us wait for a summary of “one of the most productive, interesting and overall great seasons we have had since the project began (in 1996…).” Check out the rest of his blog for season-end photos. I failed to note previously a couple of articles following up on the discovery of the “palace of David” at Khirbet Qeiyafa. A Baptist Press article provides some balanced coverage. And excavation volunteer Luke Chandler gives his personal perspective. The theater in Assos is being renovated to accommodate events for up to 5,000 people. Mark Wilson provides some background for 1 Corinthians 3:17 from the destruction of the Ephesian temple of Artemis. 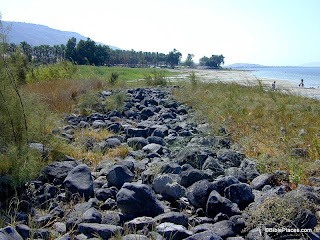 In the 1970's and 1980's, the remains of several ancient harbors were identified around the Sea of Galilee. At least 13 harbors have been identified, all of which most likely date to the Hellenistic and Roman Periods. A map of the various harbors can be seen here. The work of archaeologists in this area (most notably, the labors of Mendel Nun) have provided us with significant insights into what life was like for fishermen who worked on the Sea of Galilee during these periods. 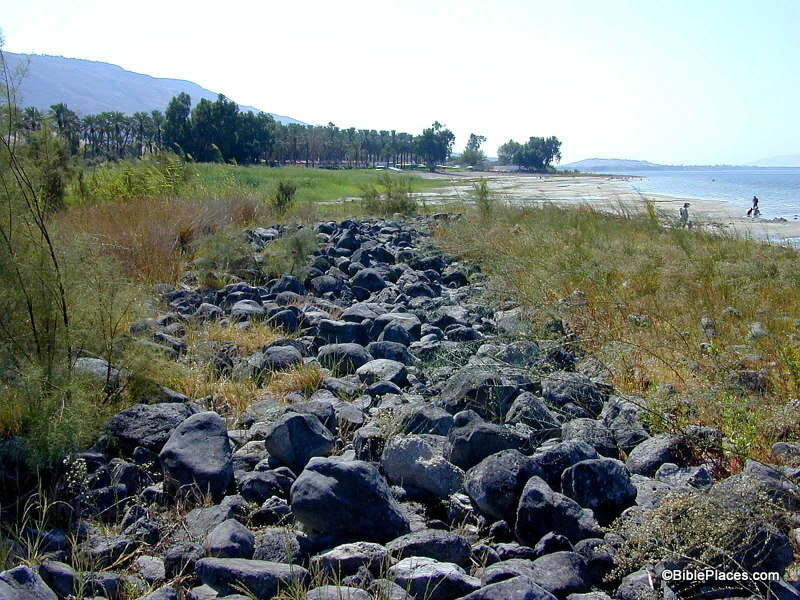 Our picture of the week comes from Volume 1 of the Pictorial Library of Bible Lands, and shows the remains of the main breakwater of the harbor of Susita (a.k.a., Hippos) on the southeastern shore of the Sea of Galilee. The photo was taken at a time when the water level in the lake was extremely low, so the breakwater stands several meters from the shore. However, in ancient times this breakwater would have provided boats with shelter from dangerous storms that can occur on the lake (for example, see Matt. 8:23-27). The harbour of Susita was built to fit the conditions of the sandy shore. The central breakwater is 120 meters long; its base is five to seven meters wide. The stone breakwater projecting from the shore turns to the south and runs nearly parallel to the shore at a depth of -211.25 meters [693 feet below sea level] for another 85 meters. At the far end it curves sharply to the west and extends into the lake to a depth of -212.5 meters [697 feet below sea level]. This shape makes for a long inner area open to the south; a second breakwater was therefore constructed which extends from the shore for 40 meters. The inner part of the harbour thus formed a closed basin enclosing an area of about an acre. A small jetty leading north from the breakwater was for passengers embarking and disembarking, saving them the tedious procedure of passing through the narrow harbour entrance. Indications that this entrance was deepended [sic.] may still be seen. Harbors such as this bear witness to the thriving economy around the lake during the time of Christ. Although people have probably always fished in the lake, the Roman Period was a time when fishermen were especially active and an unusually high number of settlements were constructed around the Sea of Galilee. According to Mendel Nun, "all settlements on the shores of the Sea of Galilee, even the smallest, had an anchorage, each built to suit local conditions and requirements." (Ibid., p. 27.) So harbors such as this would have been part of the everyday life of people living next to the lake. Insights such as this add color to our reading of the stories in the Gospels. This photograph and over 1,100 others are available in Volume 1 of the Pictorial Library of Bible Lands, and is available here for $39 (with free shipping). Additional images of the Sea of Galilee can be found on the BiblePlaces website here and here, and on LifeintheHolyLand.com here. Images and information about fishermen on the Sea of Galilee in the 19th century can be found here on LifeintheHolyLand.com. Additional information about the ancient harbors around the Sea of Galilee can be found here. The discovery of an ancient olive press in Jerusalem was announced yesterday. The “Naked Archaeologist” is suing one of its many critics in Israeli court. Megiddo V: The 2004-2008 Seasons is now available from Eisenbrauns. The warm springs of Sachne/Gan HaShlosha are one of the best places to swim in Israel, particularly on a school day when the crowds are absent. The BibleMap App connects every chapter of the Bible with Google Maps. Chris McKinny has been leading students from The Master’s College IBEX program at the Tel Burna Excavation Project for several years. His work is the subject of a new article on the college’s website. 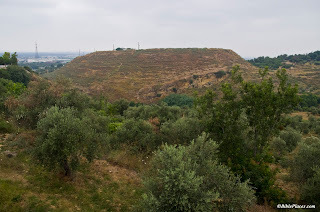 Luke Chandler shares a 7-minute video of a recent field trip to the important site of Gezer. Tourists will surely be affected by the massive renovation of Highway 1 between Tel Aviv and Jerusalem. Whenever you see a sensational claim such as the discovery of a specific item mentioned in the Bible, you should be suspicious. In most cases, the archaeologist seems to be driven more by a desire for attention than by the evidence (e.g., the Cave of John the Baptist, the palace of David, or anything announced by Yosef Garfinkel in the last six years). The article does not attempt to evaluate this sensational claim. While there are or will be critiques by scholars who dismiss the veracity of the biblical account, this analysis comes from one who believes in the accuracy of the Old and New Testaments. 1. The inscription that mentions Elisha is incomplete and the reading is reconstructed. This article does not make it clear how many letters are missing, but some have been supplied by scholars. This conjecture may or may not be correct. 2. There is no reason to believe that there was only one person named Elisha in ninth century Israel. Though only one is named in the Bible, others may well have existed. 3. Even if this inscription reads Elisha, there is no reason to believe that Elisha inhabited the building where it was found. Many other scenarios can be imagined apart from his residence here. 4. There was presumably more than one room in ninth-century Israel that had a table and a bench. Though 2 Kings 4:10 says that Elisha’s room in Shunem had a table, bed, chair and lamp, this does not indicate that every room in Israel with a table and a bench belonged to Elisha. 5. The presence of incense altars is not particularly unique as they have been found in many locations. I would argue that the presence of such altars is evidence against Elisha’s presence, for surely he would have advised for their destruction because they violated God’s law (cf. 1 Kgs 3:3; 2 Kgs 12:3). 6. While the location of Tel Rehov seven miles (12 km) from Elisha’s hometown of Abel Meholah is interesting, it seems an unlikely place for Elisha to have a lodging place only a two-hour walk from home. 2 Kings 4 says that the Shunamite woman prepared a room for Elisha and this makes sense given its position midway between his destinations of Abel Meholah and Mount Carmel. It is not clear why Elisha would need another one, and there is no evidence in the Bible that he stayed at Tel Rehov. It is not impossible that this discovery is everything that the article suggests, but adding improbability to improbability does not make the case stronger. The quotation near the end that this is “one more proof [of biblical accuracy] for what we call the doubting world” is an all-too-common example of failing to analyze the data when the proposal fits your beliefs. It happens on both sides, but it bothers me more when it happens on mine. Area of Elisha’s ministry; Tel Rehov is near Beth-shan. Jerusalem, July 22, 2013 — Researchers from the Hebrew University of Jerusalem's Institute of Archaeology are inviting the public to participate in free guided tours of three diverse archaeological sites. On August 2, 8 and 20, the archaeologists will lead tours that shed light on the rich history of some of Israel's most fascinating ancient sites. At each of these locations they will offer a guided tour: Tel Dor (August 2), Ein Qashish (August 8), and Nahal Ein Gev (August 20). Admission is free and there is no need to register in advance. Participants must bring hiking shoes, an adequate supply of water and a hat. Sunblock is recommended. For more information, contact the Secretariat of the Institute of Archaeology at 02-5882404 or 02-5882403. Site visit date: Friday, August 2 at 8:30 a.m. The site: Tel Dor is located on Israel's Mediterranean coast, about 30 km south of Haifa. The documented history of the site begins in the Late Bronze Age and ends in the Crusader period. The port dominated the fortunes of the town throughout its 3000-odd year history. Dor was successively ruled by Canaanites, "sea peoples," Israelites, Phoenicians, Assyrians, Persians, Greeks and Romans. Its primary role in all these diverse cultures was that of a commercial entrepot and a gateway between East and West. Site visit date: Thursday, August 8 at 8:30 a.m. and 10:30 a.m.
Ein Qashish is an open-air Middle Paleolithic site located on the bank of the Qishon River, close to many of the major Middle Paleolithic cave sites in northern Israel, in an area where practically no open-air sites have been known before. The site was discovered in 2004 by survey teams of the Israel Antiquities Authority. Work at the site was carried out in 2005 and then again in 2009-2010 on behalf of the Institute of Archaeology at The Hebrew University of Jerusalem. Site visit date: Tuesday, August 20 at 8:30 a.m.
Nahal Ein Gev is located about 2 km east of the shores of the Kinneret. The site belongs to the Natufian period, about 11,500 years before our time, and exposes a village of the last hunter-gatherers who lived on the eve of the Agricultural Revolution, leaving complex and fascinating remains. According to the incoming Head of the Institute of Archaeology, Prof. Erella Hovers, "A lot of the Institute of Archaeology's activity is conducted on Mount Scopus in Jerusalem, but each summer the Institute's scholars go to work on a large number of archaeological sites from different periods and in different regions in the country, thus taking research out of the lab and into the field. This is an opportunity for us to invite the public to experience the extensive research activities of the Hebrew University's Institute of Archaeology as they unfold before us." Prof. Hovers added: "The archaeological sites are cultural treasures of the State of Israel and we are happy to reveal them directly to its people by hosting visitors our dig sites. We will gladly present how archaeological field work is done, what research questions led us to these excavation sites, and what 21st century archaeological science is all about." For information about the tours, contact the Secretariat of the Institute of Archaeology at 02-5882404 or 02-5882403. Yesterday the State Attorney’s office in Israel announced that it was withdrawing its appeal on the allegedly forged items in the collection of Oded Golan. Hershel Shanks has written a brief update on the situation. The Israel Antiquities Authority is scheduled to return the famous ossuary, or bone box, inscribed “James, son of Joseph, brother of Jesus” to Oded Golan, the Israeli collector who owns it, after a five-year trial charging that he forged the Jesus reference in the inscription. In March 2012, the trial judge Aharon Farkash acquitted Oded Golan of the forgery charge. Stung by the verdict, state prosecutor Dan Bahat (not the eminent Israeli archaeologist of the same name) mounted an appeal of some aspects of the verdict, but not the James Ossuary. The government apparently accepted as final the judge’s decision regarding the ossuary. On July 18, Bahat’s superiors in the office of the State’s Attorney announced to the Israel Supreme Court that it was withdrawing the appeal on other aspects of the verdict. The update continues here. I have noted in the past that most experts believe that the James Ossuary inscription is authentic and many believe that the Jehoash Tablet is as well. I still remember the first time I studied the descriptions of the Tabernacle in detail. I was a college student at the time and was taking an Old Testament Survey course. I combed through the descriptions of the Tabernacle in Exodus 25-30 and did the best I could (with the limited knowledge that I had) to picture what the various items looked like and how they fit together. Now some of the Hebrew terms in this passage are difficult to accurately interpret (for example, the word translated "calyx" in the ESV is translated as "bulb" in the NASB), but it is clear that the menorah in the Tabernacle incorporated elements of almond blossoms. So to get an idea of what the menorah looked like, you need to know something about the shape of almond blossoms. Unfortunately, as a college student from the suburbs of Southern California, I had no clue what an almond blossom looked like. So to remedy that situation (for myself and for the sake of others like me) our picture of the week comes from Volume 16 of the Pictorial Library of Bible Lands. This is an entirely new volume that was added when the collection was revised and expanded last year and it focuses on "Trees, Plants, and Flowers of the Holy Land." (For another sample from this collection, see my post here.) 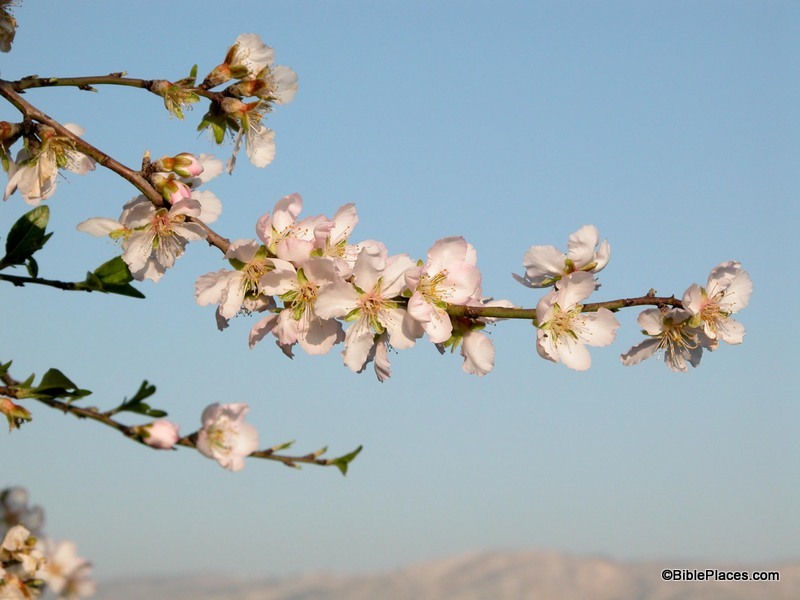 The photograph below shows a branch of almond blossoms on a tree near Aijalon in Israel. You can click on the photo to enlarge it. Given an image like this, it is not difficult to imagine what the branches of the Tabernacle's lampstand may have looked like. Each of the six outer branches of the menorah incorporated three almond blossoms and the center branch somehow incorporated four blossoms. Although we may not be able to reconstruct the exact details of the lampstand with certainty, a picture like this goes a long way in enlightening our reading of the text. This photograph and over 1,500 others are available in Volume 16 of the Pictorial Library of Bible Lands, and is available here for $34 (with free shipping). Additional photographs from that collection can be seen here, here, and here on the BiblePlaces website. For one reconstruction of the Tabernacle's lampstand, see images of the Tabernacle replica here and here. Two royal public buildings, the likes of which have not previously been found in the Kingdom of Judah of the tenth century BCE, were uncovered this past year by researchers of the Hebrew University and the Israel Antiquities Authority at Khirbet Qeiyafa – a fortified city in Judah dating to the time of King David and identified with the biblical city of Shaarayim. One of the buildings is identified by the researchers, Professor Yossi Garfinkel of the Hebrew University and Saar Ganor of the Israel Antiquities Authority, as David’s palace, and the other structure served as an enormous royal storeroom. Today (Thursday) the excavation, which was conducted over the past seven years, is drawing to a close. According to Professor Yossi Garfinkel and Sa'ar Ganor, “Khirbet Qeiyafa is the best example exposed to date of a fortified city from the time of King David. The southern part of a large palace that extended across an area of c. 1,000 sq m was revealed at the top of the city. The wall enclosing the palace is c. 30 m long and an impressive entrance is fixed it through which one descended to the southern gate of the city, opposite the Valley of Elah. Around the palace’s perimeter were rooms in which various installations were found – evidence of a metal industry, special pottery vessels and fragments of alabaster vessels that were imported from Egypt. The palace is located in the center of the site and controls all of the houses lower than it in the city. From here one has an excellent vantage looking out into the distance, from as far as the Mediterranean Sea in the west to the Hebron Mountains and Jerusalem in the east. This is an ideal location from which to send messages by means of fire signals. Unfortunately, much of this palace was destroyed c. 1,400 years later when a fortified farmhouse was built there in the Byzantine period”. A pillared building c. 15 m long by 6 m wide was exposed in the north of the city, which was used as an administrative storeroom. According to the researchers, “It was in this building the kingdom stored taxes it received in the form of agricultural produce collected from the residents of the different villages in the Judean Shephelah. Hundreds of large store jars were found at the site whose handles were stamped with an official seal as was customary in the Kingdom of Judah for centuries”. The palace and storerooms are evidence of state sponsored construction and an administrative organization during King David’s reign. “This is unequivocal evidence of a kingdom’s existence, which knew to establish administrative centers at strategic points”, the archaeologists say. “To date no palaces have been found that can clearly be ascribed to the early tenth century BCE as we can do now. Khirbet Qeiyafa was probably destroyed in one of the battles that were fought against the Philistines circa 980 BCE. The palace that is now being revealed and the fortified city that was uncovered in recent years are another tier in understanding the beginning of the Kingdom of Judah”. The exposure of the biblical city at Khirbet Qeiyafa and the importance of the finds discovered there have led the Israel Antiquities Authority to act together with the Nature and Parks Authority and the planning agencies to cancel the intended construction of a new neighborhood nearby and to promote declaring the area around the site a national park. This plan stems from the belief that the site will quickly become a place that will attract large numbers of visitors who will be greatly interested in it, and from it one will be able to learn about the culture of the country at the time of King David. To my conservative friends, I’d urge caution before making any bold claims based on Garfinkel’s work. Or any claims at all. Let’s wait and see how credible archaeologists evaluate his stratigraphy. If he’s correct, we’ve lost nothing by being patient. For previous posts related to Khirbet Qeiyafa, see here. The high-resolution images below are available from this link. UPDATE: The Jerusalem Post has some background on the previous years of excavation. The Arutz-7 headline dubs the find as “King David’s ‘Suburban Palace.’” The Times of Israel includes a review of Eilat Mazar’s alleged excavation of David’s palace in Jerusalem. It's no coincidence that on the last day of excavation an announcement so "momentous" should be made. It's all about attention, fund raising, the lecture circuit, the headlines. But it's not about archaeology. Nor is it about history. And it calls into question the right to call oneself an academic. When science, research and intellectual honesty are held hostage to sensationalism, then the public, the truth, and the legitimacy of showing the deep roots of the Jewish people in the Land of Israel are done terrible damage. The archaeologists become a laughing stock - and those wishing to delegitimise the State of Israel are given another arrow in their bid to destroy that connection. That the IAA would enable this unprofessional and egregious charade is nothing less than shameful. First two photos by Sky View courtesy of the Hebrew University. Third photo by Clara Amit. All photos courtesy of the Israel Antiquities Authority. The Jerusalem Post has a feature story on the current excavations at the Philistine city of Gath. For daily updates, see the excavator’s blog. In particular, you may want to check out this remarkable 3-D image of Area A. The Post also reports on a new virtual tour of the Temple Mount, online at HarHakodesh.co.il. 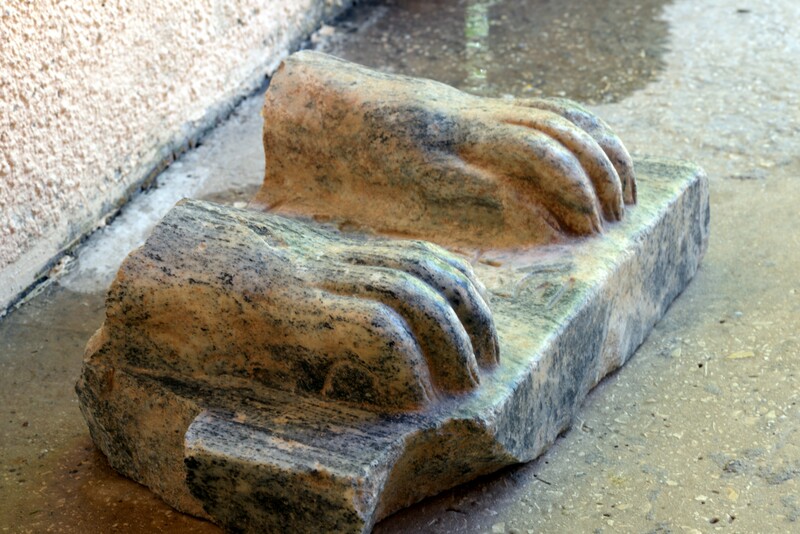 The sphinx found at Hazor is described by the archaeologists in a 3-minute video. Apparently this was the last of 24 years of excavations at the site. UPDATE (7/19): My interpretation that this was the final season was incorrect. See comments below. Tel Aviv University is offering a free online course via Coursera on “The Fall and Rise of Jerusalem,” taught by Professor Oded Lipschits, Ph.D. and Ido Koch. John H. Hayes died last week at the age of 79. Daniel M. Master is the editor-in-chief of a new reference that will be of interest to many here. The Oxford Encyclopedia of the Bible and Archaeology is a 1200-page work that includes 130 lengthy essays on biblical sites, regions, and lifeways. The editorial board includes Jürgen K. Zangenberg, Avraham Faust, Beth Alpert Nakhai, and L. Michael White. For many years, under Albright's influence, the hybrid field of Biblical Archaeology had a life of its own in the United States and was considered a coherent discipline. But many outside of Albright's sphere were unsure whether this field was a division of biblical studies or part of the broader world of general archaeology and saw these two pursuits in some disciplinary tension. At the same time, biblical scholars grew increasingly skeptical that archaeology could provide context for the specific events of the biblical text. Individual excavations persisted, but work ceased to be framed by research designs derived from the questions of Biblical Archaeology. Yet archaeologists of the last twenty years have continued to produce material for biblical studies that is too critical to be ignored: inscriptions such as the Tel Dan stele or Khirbet Qeiyafa ostracon, debates on the chronology and stratigraphy of the 10th century BCE or the stratigraphy of the Shechem temple, and publications such as those of the Jewish Quarter in Jerusalem or Herodian Jericho. Shifts in archaeological theory and biblical scholarship now present new potential for rapprochement between archaeology and the Bible. Recent archaeological work has uncovered the lifeways of the biblical world and begun to suggest how understanding these lifeways transforms the reading of the biblical text. The Oxford Encyclopedia of the Bible and Archaeology represents a new way of conceiving of the relationship between archaeology and biblical studies that allows the results of a wide cross-section of excavations and regional studies to contribute to the interpretation of the biblical text through an elucidation of the lifeways of the ancient world. By going beyond mere chronology and focusing on the social organization of biblical society, the Encyclopedia is an important methodological breakthrough for the study of the Bible and archaeology. Amazon lists the 2-volume work for $281 and shows it being released on Monday, July 15. Dove Booksellers has it for $265 plus $7 shipping. Eilat Mazar is claiming to have found the earliest alphabetic inscription ever discovered in Jerusalem. Readers may recall that she found the earliest written inscription several years ago in a fragmentary cuneiform tablet. She is dating this one to the tenth century BC, but the basis for this date is not given. Mazar has been heavily criticized in the past for dating her discoveries to the time of David in order to attract more publicity. The full press release is available here. The story is also reported by The Times of Israel and Arutz-7. Some brief thoughts are offered by George Athas and Paleojudaica. The latter wishes the inscription read “for King Solomon.” The closest thing to an official blog for Mazar’s excavations is this one, but it does not yet mention the discovery. Eilat Mazar holds the recently discovered inscription. The inscription was written around the top of a storage jar. Photos courtesy of Dr. Eilat Mazar; photographed by Ouria Tadmor. The Hazor Excavations are headed by Prof. Amnon Ben-Tor, the Yigael Yadin Professor in the Archaeology of Eretz Israel at the Hebrew University’s Institute of Archaeology, and Dr. Sharon Zuckerman, a lecturer at the Hebrew University’s Institute of Archaeology. Along with the king’s name, the hieroglyphic inscription includes the descriptor “Beloved by the divine manifestation… that gave him eternal life.” According to Prof. Ben-Tor and Dr. Zuckerman, this text indicates that the Sphinx probably originated in the ancient city of Heliopolis (the city of 'On' in the Bible), north of modern Cairo. All photos courtesy of archaeologists Prof. Amnon Ben-Tor and Dr. Sharon Zuckerman (shown above). An ancient road leading from Yafo [Jaffa] to Jerusalem, which dates to the Roman period (second–fourth centuries CE), was exposed this past fortnight in the Beit Hanina neighborhood in northern Jerusalem. The road remains were revealed in an archaeological excavation the IAA conducted in Beit Hanina prior to the installation of a drainage pipe by the Moriah Company. The wide road (c. 8 m) was bounded on both sides by curbstones. The road itself was built of large flat stones fitted to each other so as to create a comfortable surface for walking. Some of the pavers were very badly worn, indicating the extensive use that was made of the road, and over the years the road also underwent a series of repairs. According to David Yeger, excavation director on behalf of the Israel Antiquities Authority, “Several segments of the road were previously excavated by research expeditions of the IAA, but such a finely preserved section of the road has not been discovered in the city of Jerusalem until now”. The press release includes more information and three high-resolution images are available here. Roman road discovered near Jerusalem. Photo by Assaf Peretz, courtesy of the Israel Antiquities Authority. Picture of the Week: The Church of All Nations ... Even the U.S.
Where can you see the American seal in Jerusalem? In honor of Independence Day in the United States, this week's "Picture of the Week" will show you. 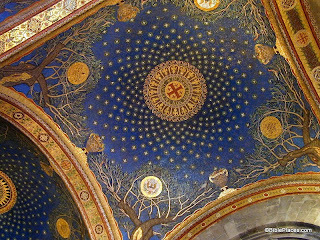 The photo above was taken in the Church of All Nations (also known as the Basilica of the Agony) on the Mount of Olives. The church is built over the traditional location of the place where Jesus prayed the night he was arrested. The modern church was completed in 1924, but it sits on the location of two earlier churches: one from the fourth century and another from the twelfth century. The photograph shows the interior of one of the church's twelve cupolas. The American seal can be seen at the bottom of the photo (click the picture to enlarge it). The ceiling of this church actually contains the seals or coats-of-arms of several countries, all of whom donated money to help construct the building. Argentina, Belgium, Brazil, Canada, Chile, England, France, Germany, Italy, Mexico, Spain, and the U.S. are all represented. This church ... built in 1924, is located on the traditional site of the garden in which Jesus collapsed. No one can be sure of the exact spot at which he prayed, but this limited area was certainly close to the natural route leading from the Temple to the summit of the Mount of Olives and the ridge leading to Bethany. The present edifice ... is the latest in a series of three churches. It covers 'the elegant church' (Egeria) built between AD 379 and 384 ... on the site where the pre-Constantinian Jerusalem community commemorated the prayer of Christ. Willibald, in 724-5, is the last pilgrim to mention this church; it was destroyed by an earthquake some twenty years later. The Crusaders first built an oratory in the ruins which they later (c.1170) replaced by a church .... The fate of this building is unknown; still functioning in 1323, it was abandoned in 1345. Additional information about the modern church (as well as additional pictures) can be found on the Franciscan Cyberspot here. A 360-degree image of the inside of the church is available here. This photo and over 1,500 others are available in Volume 3 of the Pictorial Library of Bible Lands, which can be purchased here for $39 (with free shipping). Additional photos and information about the Mount of Olives is available here on the BiblePlaces website. This page on LifeintheHolyLand.com includes a photograph of the area taken in the 1890s before the Church of All Nations was built. Excerpt was taken from Jerome Murphy-O'Connor, The Holy Land: An Oxford Archaeological Guide from Earliest Times to 1700, 4th ed. (Oxford University Press, 1998), pp. 128-129. The fifth edition of this book is available here. Archaeologists discover holes carved into the ground in Shiloh which could have held the beams of The Tabernacle or Tent of Meeting, which, according to the Bible, housed the Ark of the Covenant. The Tabernacle or Tent of Meeting -- which, according to the Bible, housed the Ark of the Covenant -- was a temporary structure made of wooden beams and fabric, not materials cut out for thousands of years of survival. 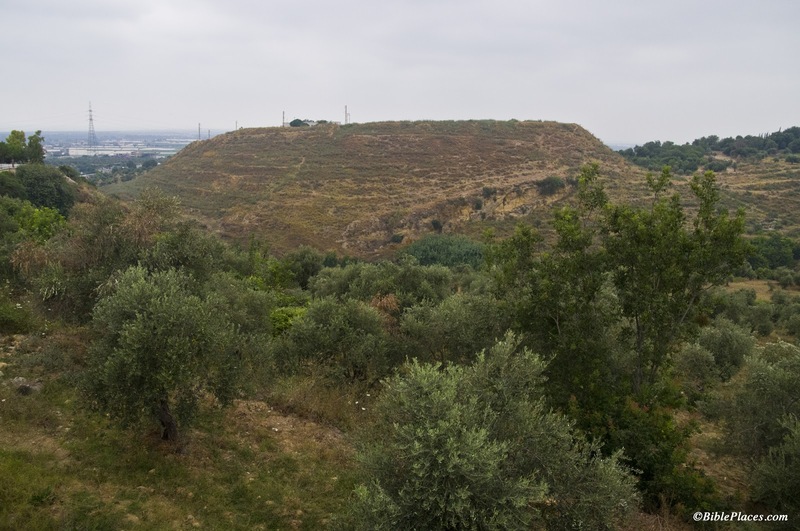 Nevertheless, undaunted, archaeologists have searched for evidence of the Tent of Meeting for years, which they posited would be found in ancient Shiloh (next to the settlement of Shiloh in the Binyamin region). Now it appears their efforts have borne fruit, yielding assumptions that the Tent of Meeting indeed stood there. The findings, which will be presented at a conference of the Shiloh Association scheduled to take place this week in ancient Shiloh, include the discovery of holes carved into the ground which could have held the beams of a temporary structure. Because the Tent of Meeting and Ark of the Covenant were portable, archaeologists are considering the possibility that the Tent of Meeting stood there. The Tent of Meeting served as a place of prayer and sacrifice until the First Temple in Jerusalem was built by King Solomon. Near the holes, in the northern part of Tel Shiloh, structures were unearthed that correspond to the dates when Joshua first settled the land of Israel until the period of King David's reign. One of these structures was found to contain ceramic vessels as well as three large taboon clay ovens. The article explains why archaeologists believe these vessels were used in the tabernacle. Thee excavators also found a section of the city wall of Shiloh. Arutz-7 also reports on the discovery. Background and photos of the site of Shiloh are here, and images of a tabernacle replica in southern Israel are here. Area of tabernacle discovery before excavations. Photo from Pictorial Library of Bible Lands, volume 2.